Treen are household objects (but not furniture) made from wood. Treen objects are highly collectible now, as most were in daily use in regular households and were less likely to survive than similar objects made from more expensive pottery or metal. 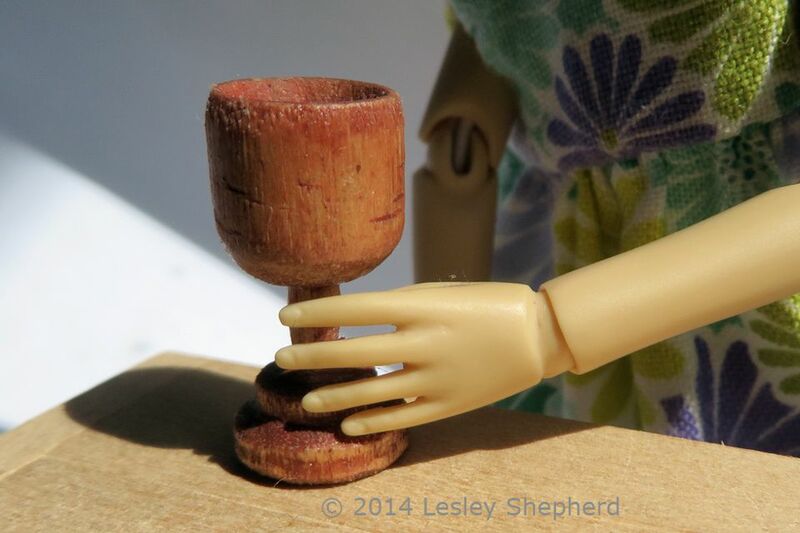 I've set up this simple tutorial to make wooden dollhouse goblets so you can begin to explore making treen objects in small scales. These goblets are highly suitable for early dollhouse periods, but can be shown as collectibles in a modern dollhouse, or carved to reflect the taste for Danish modern furniture. To make miniature wooden goblets, drinking vessels or other objects you will need a wood cylinder. I used a length 3/8 inch (8mm) wood dowling 1 1/2 inches (4 cm) long to make a goblet roughly 3/4 inch (2 cm) tall. To simplify the process you may be able to find wooden beads with a basic goblet shape, or as shown here, a piece of shaped kitchen rail trim from a lumber supplier. To shape the goblet by hand, I used a mini drill (pin vise) and several small files, including a round file and a flat file. If you don't have files, you can substitute sandpaper wrapped around toothpicks and craft sticks. Or you can use emery boards and nail files. I also used fine sandpaper, and a craft knife that holds a sharp scalpel blade (mine is from Lee Valley Tools.) If you are new to simple wood carving, you may want to use a pair of gloves or carver's tape to protect your hands. To cut my goblet free from the dowel I used a razor saw and a miter box. The "trick" to shaping these miniature goblets is to do the heavy work before you begin to work on thinner sections like the goblet stem. To begin carving out the 'bowl' of the goblet, determine roughly how deep you want your goblet to be, then drill a set of holes into the top of the goblet bowl (the top of your dowel) beginning with a hole in the center, surrounded by a ring of outer holes. Leave lots of working space (at least 1/32 inch ( 1mm) to the outer edge of your goblet so you have space to shape the inner bowl of the goblet. Drill your holes to roughly 1/2 the depth of your goblet. You can put a bit of tape or a felt pen mark on the drill bit to mark how deep you want to drill your holes. Once you have drilled your holes, you can use a sharp scalpel blade in a craft knife to begin hollowing out the center of your goblet. For now, just concentrate on removing the bits of wood between your drilled holes. NOTE: Make sure you wear eye protection when carving, hold your knife safely, and use gloves or carving tape to protect your hands. For more details on how to carve if you are new to the process, see the tutorial for carving a miniature rope molding. You don't need to completely carve out the center of your goblet in this step, you will complete the shaping of the inner goblet using files in later steps. Note: If you want to make a (more or less) matched set of goblets, mark all the goblets at the same time, and complete the same step on each goblet before you move on to the next finishing step. If you make one, then the next all the way through to completion, your later versions will probably show how your technique is improving. You may not get a matched set. Once you have marked the main sections for your goblet on your dowel, make a 'stop cut' straight into the dowel at the bottom of the stem line, setting the line completely around the dowel. The bits you carve from your dowel will be started at the base of the goblet bowl, and will end at the cut line or 'stop line' . Make a line for a reference mark all the way around the base of the goblet bowl. This line is where you will start your carving cuts to begin shaping the goblet stem. When carving away bits of your dowel, take care to rotate the dowel and carve equal bits from all sides, you want to keep your goblet stem straight and centered on the goblet bowl. If you rotate your dowel as you carve, your stem should begin to be narrow at the base where your stop lines make a neat end to the stem and a beginning for the goblet base. The base of your goblet bowl should be roughly even as shown in the photo on this page. Don't keep carving to try to finish your goblet stem with your carving knife. It is easier to make a regular stem using a set of miniature files (or a nail file or sandpaper) once you get the basic shape of the stem . (see the next step). When your stem has begun to take shape, start to use your files to make an even base line for the base of the goblet, and shape the stem and the base of the goblet using miniature (needle) files. A square flat file or a tapered flat file are best for this purpose. To shape the base of the goblet as shown, the flat file was used at an angle of roughly 45 degrees. To hold the goblet while you file it, see the photo on step 9 of these instructions. Once you have the stem and the base of the goblet bowl roughly shaped (and even when you turn your goblet) begin to shape the upper section of the goblet base by holding a flat file against the dowel and reducing the upper edge of the base as shown. See the next step for a method of holding the dowel while you turn it. This will help you keep your file cuts even all the way around your goblet. To keep your shaping even as you work with a file against your dowel, hold the dowel between your thumb and index finger, with the other fingers acting as a brace against the back of the dowel. Take care to rotate the dowel every two or three passes with the file. Make sure the file is always held straight across the section you are filing, so the goblet will remain square and true as you shape it. When you have the goblet stem roughly finished, and have begun shaping the base of your goblet you can finish hollowing out the goblet bowl. To do this, use a round file with a flat tip (cylindrical file) Place it in the center of the roughly carved bowl and rotate it around the bowl, keeping it in a straight line with the dowel. Keep filing down the sides of the bowl, keeping them straight as you work. Tap the dowel every few file passes to clear away the sawdust. A tap on a tabletop will also help clear the sawdust from your file. Keep hollowing out the bowl until the sides are almost as thin as you would like. Take sandpaper on a square sanding block and rub the top of the goblet gently in a figure 8 over the sandpaper to make sure the top of the goblet is flat. To finish shaping your miniature goblet, use your files to gently smooth the base of the goblet bowl, and to narrow the rim of the goblet at the top (see photo). To make narrow lines on the base of your goblet you can wrap a piece of stiff plastic or metal with a folded section of fine sandpaper and use it to make a ridge line around the goblet. Experiment with round and flat files to shape the goblet base. When your goblet has reached its final (pleasing) shape, carefully finish the surface with fine sandpaper (180 grit or finer) Make sure you sand with the grain of the wood. Try to avoid sanding across the grain for the best finish. See the next step for how to apply finish to your miniature goblet. To show the grain of your wood, you may want to stain or color your goblet. I applied a stain made from diluted brown and red acrylic paint, wiping the paint off before it could fully soak into the wood. Once dry, the surface was sanded to reduce the grain raised by the stain. After sanding the goblet was dusted off with a fine paintbrush, and a layer of clear matte acrylic varnish was applied. The final step is to apply a thin coat of furniture wax and polish the goblet to a gentle sheen. If you prefer, you can make this a one step process by using a light buffing of colored shoe polish (wax, not liquid) on your goblet. Make sure you apply the polish with a soft cloth instead of a brush. Experiment with making a fitted lid for your goblet. Or use the technique to make narrower bowls suitable for holding candles and you will have candlesticks instead of goblets. Have fun! Your practise will improve your skill and your collection of miniatures.